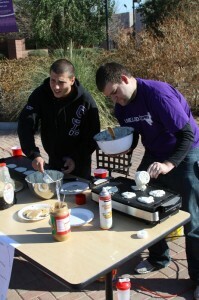 Pancake flippers Tyler Bhirdo and Jarred McDonald. 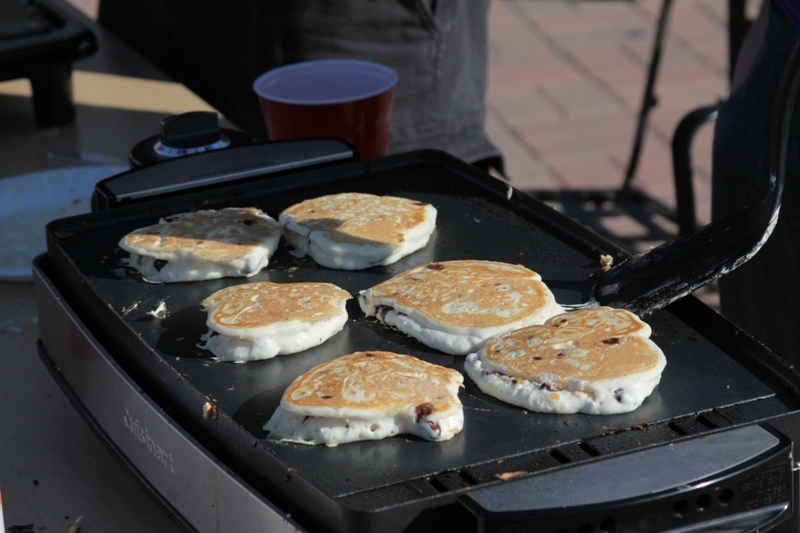 Free pancakes outside the Student Union? What’s the catch? There were no strings attached Thursday morning as RAs Tyler Bhirdo and Jarred McDonald served up regular and chocolate-chip flapjacks, hot off the griddle. But that didn’t stop people from asking. “We’ve had probably five or six people ask us if they had to sign something to get their pancakes,” said McDonald, a junior biology major. McDonald and Bhirdo, a junior business major, hatched the idea earlier in the week. They wanted to make use of some Krusteaz pancake mix left over from a North Rim Apartments breakfast on Feb. 12. “We thought, ‘Hey, we should make pancakes for everybody,’” McDonald said. Armed with two griddles and long extension cords, they started at 8 a.m. just outside the main entrance to the Union. By 9:30, they had served about 250 pancakes to five dozen people, even offering complimentary orange juice to wash them down. “Who are you guys?” one customer asked before chowing down. It was a seamless operation, with one exception: The flyers they had put up on Wednesday, notifying all on campus of the freebie, had the wrong date.